Before the call that she will never forget came over the radio, Tammi Barlow ’18 was caught in conversation with the Providence police officer who had taken her for a ride-along on the overnight shift. As they drove around the South Side, alive and vibrant in the final hours of PrideFest, they compared notes on her native Chicago, where murder is all too common, and Providence, where they expected a night dealing with noise violations and intoxication. 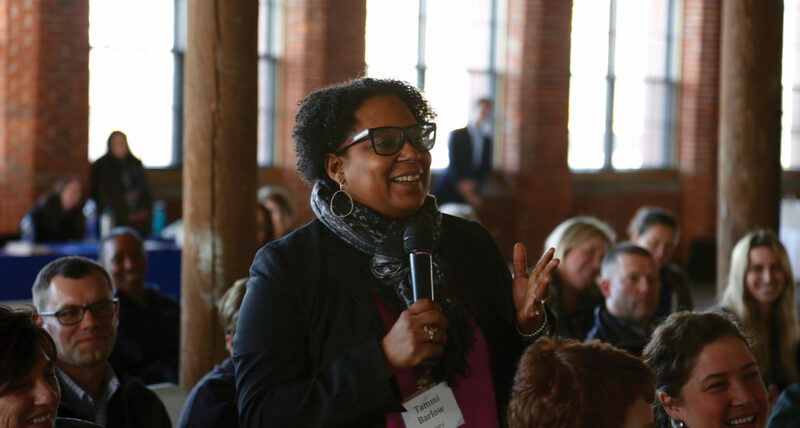 Barlow, Manager of Responsible Gaming and Corporate Social Responsibility for IGT, was on the ride-along as an enhancement to the Leadership Rhode Island Core Program, a time-honored tradition for all LRI participants. She had just asked the officer how he would know if an emergency was happening – like gunshots – and he was explaining how a special siren would sound, when that very thing happened. “I was a part of this from the time the special alarm went off in the police SUV to them putting up the crime scene tape, pulling his lifeless body out of the car, rushing him to the ER in crowded streets, waiting for him at RI Hospital which is a trauma one hospital, watching them try to pump life into him, hearing the paramedics say, there’s 1% chance he’ll survive, to hearing them call time of death. Because I am black and he was unidentified, the hospital personnel assumed I knew him, and because I was with a cop they let me see more than my mind should have. But then I witnessed the loneliness of death as they cut off his clothing, bagged up all the evidence for the homicide detectives, pulled his bloody, lifeless body onto the stretcher to take him to the morgue. Alone. No family. No friends. Situation unknown. Barlow recounted the experience months later, following the Xi II commencement. After she returned home the morning of the shooting, she took her children – a 14-year-old boy and 10-year-old girl – to the crime scene. For Barlow, the worst part was seeing Jacorey Sanders, a 25-year-old father of two from New Bedford, die alone. That day, Barlow resolved that she would turn her experience into positive action. She connected with Angie Ankoma ’14, Executive Vice President at the United Way of Rhode Island, whom she sees as a positive community leader. On her LRI commencement day, Barlow and her classmates were asked to write down a pledge. While she figures it out, the single mother will focus on her own children, whom she adopted from a group home. Having moved to Rhode Island in January 2015, she is grateful for her LRI experience.